Every year for Christmas I enjoy making a homemade gift for my friends, family, and coworkers. Typically it’s something from my kitchen, and past years have included chocolate dipped peppermint marshmallows, red pepper jelly, and truffles. 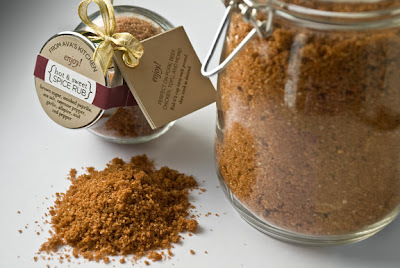 For this year’s gift I shared one of my favorite spice rubs from Thomas Keller’s cookbook Ad Hoc at Home. I made a few big batches of the rub and packaged it in cute little 4 ounce glass jars that I got at Ikea. I then affixed to the jar a label, gold bow, and a tiny recipe book with cooking suggestions for the rub. I originally fell in love with this rub after receiving a tin of Ad Hoc Rub from my friend Sue who had bought it for me for my birthday from Williams Sonoma. It was absolutely delicious, so imagine my delight when I found the recipe for the same rub in my Ad Hoc cookbook (also a birthday present from Sue and Lara). Williams Sonoma sells a 3 ounce container for $12.00, so save yourself $11.50 and make it at home! This spice rub is sweet and spicy, and is perfect on chicken, beef, pork, tofu and more. Combine all ingredients. This rub is perfect on pork, beef, chicken, tofu, and more. Rub ½ cup onto each pound, and then cook as desired. See cooking suggestions below. Rub 1 cup onto 3 pounds of chicken wings. Refrigerate for at least 2 hours to develop the flavors. Bake skin side up in a single layer on a foil lined baking dish at 375 degrees for 45 minutes. Flip wings once after 30 minutes of baking. Rub ½ cup of spice rub onto 1 pound of grass-fed sirloin steak tips. Marinate at room temperature for ½ hour. Grill over medium-high heat to desired doneness. Mix ½ cup of rub with ¼ cup of extra virgin olive oil and ¼ cup water. Pour over 1 pound of bone-in pork chops and marinate overnight. Place the pork chops in a foil lined baking dish and pour the marinade over top. Bake at 375 degrees for 45 minutes. Rub ½ cup onto 1 pound of chicken breast tenders. Sauté with extra virgin olive oil in a non-stick skillet over medium high heat until caramelized and cooked through. Sauté ½ pound of pressed and cubed extra firm tofu in a non-stick pan with extra virgin olive oil until golden. Add ¼ cup chopped pecans and 1 tablespoon of minced garlic. Sauté for 30 seconds more and then stir in 3 tablespoons spice rub. Sauté for 1 minute more, until the tofu is glazed. As one of the recipients of this gift I cannot wait to try it. Being so sick of all of the Christmas left overs I was just sitting here wondering what I will make tonight. This posting inspired me to make the chicken tenders for dinner tonight. I'll post again after we eat them. Thanks again for such a thoughtful (and as usual)creative personalized Christmas present. Love it! I hate to be all junior high, but "spice rub" just sounds nasty! hahaha! Just made the "sweet and spicy chicken tenders" and they are DEEEEE-licous! Thanks so much Melissa! @Sue Thanks so much! I'm so glad you liked the rub! @black olive Hmmm... now I wish I had called it "Spice Blend"